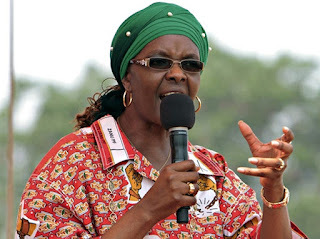 The National Prosecuting Authority (NPA) has applied to have Grace Mugabe extradited to South Africa‚ according to a lobby group that is representing the model allegedly beaten by Zimbabwe's former first lady. Grace Mugabe is alleged to have assaulted and seriously injured Gabriella Engels‚ a Johannesburg model‚ with a power extension cord in 2017. AfriForum‚ Engels and various other parties brought the rescission application. Advocate Gerrie Nel‚ head of AfriForum’s private prosecution unit‚ had stated his office would apply for a nolle prosequi certificate should the NPA fail to prosecute. Said AfriForum: "The Foreign States Immunities Act (1981) explicitly excludes the granting of immunity to heads of state who are guilty of the death or injury of people in South Africa. Grace Mugabe‚ as the wife of a former head of state‚ could therefore in no way claim the diplomatic immunity to which she appealed."